Heid E. Erdrich writes from the present into the future where human anxiety lives. Many of her poems engage ekphrasis around the visual work of contemporary artists who, like Erdrich, are Anishinaabe. Poems in this collection also curate unmountable exhibits in not-yet-existent museums devoted to the ephemera of communication and technology. A central trope is the mixtape, an ephemeral form that Erdrich explores in its role of carrying the romantic angst of American couples. These poems recognize how our love of technology and how the extraction industries on indigenous lands that technology requires threaten our future and obscure the realities of indigenous peoples who know what it is to survive apocalypse. Deeply eco-poetic poems extend beyond the page in poemeos, collaboratively made poem films accessible in the text through the new but already archaic use of QR codes. Collaborative poems highlighting lessons in Anishinaabemowin also broaden the context of Erdrich’s work. Despite how little communications technology has helped to bring people toward understanding one another, these poems speak to the keen human yearning to connect as they urge engagement of the image, the moment, the sensual, and the real. Collaborative artist, filmmaker, and independent curator Heid E. Erdrich teaches in the low-residency MFA Creative Writing program of Augsburg College. She is the author of five collections of poetry, including National Monuments, which won the 2009 Minnesota Book Award. Erdrich grew up in Wahpeton, North Dakota, and is Ojibwe enrolled at Turtle Mountain. "Heid E. Erdrich is a futurist messenger who understands that time immemorial works backward and forward, and in all sorts of media, even in a book of poetry. In this collection we see the spiral of interstellar clouds, the whirl of stuff engendered by cultural collision, and a response to the art of it all. Cultures rub up against each other to make a new kind of song. The whole collection is a dynamic mixtape: Poetry for the end of the world, which is the beginning. Yes". "Heid E. Erdrich’s poems jump off the page as this ‘curator of ephemera’ assembles the fragments of deep history and flitting moments into her Indigenous Elvis, her undead faerie, her wiindigo language lesson. In her compelling poems and poem-films Erdrich simultaneously celebrates and laments a mind at play with big art, a mind bigger than cultural separations in which, though ‘we walk on the bridge of bones,’ still words become the necessary tools to embrace the untenable sensation of grasping the moment even as it tells her that it is slipping away." 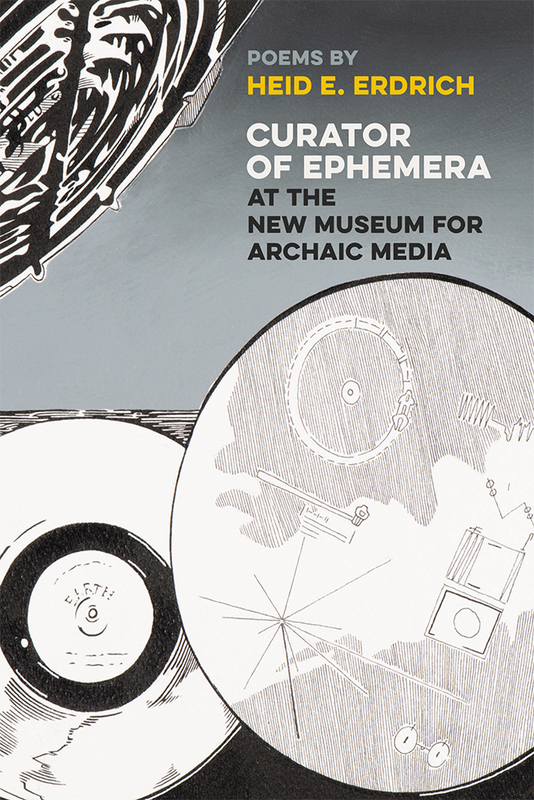 "There are so many things to love about Heid E. Erdrich’s Curator of Ephemera at the New Museum For Archaic Media, there is not enough room here to list them all. I cannot think of a recent book of poems that takes on so much—race, the colonial project, technology, art, capitalism, Native sovereignty, land and landscape, language and all it can and cannot do—in a voice that is both learned and accessible. 'These are my pearls,' writes Heid Erdrich. 'I have made them mine.' Thankfully, by showing us what poetry can and should aspire to, she has made them ours as well. This is a book not just to read but to admire."